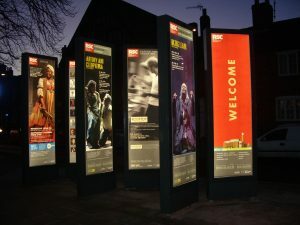 The Vitrum 100 is a monolith format poster case designed for outdoor locations although it is equally at home in shopping malls and other covered areas. With an attractive contemporary style, it is available either single of double sided. Superbly engineered using aluminium profiles, the Vitrum is secure, waterproof and lockage. As with all products in the Vitrum range, the Vitrum 100 has 5mm glass covers that can be side or top hinged using gas cylinders allowing easy access to change or update the graphics content. The covers are secured with a unique pressurised locking mechanism that will deter all but the most aggressive vandalism. The Vitrum 100 is available either unlit or with LED powered back lit illumination. The unique design of the LED sheet produces an exceptional brightness with even lighting across the entire panel which other forms of lighting cannot match. The LED panel has its own aluminium frame which cleverly holds the image directly behind the glass covers producing a stunning effect. The LED lighting system carries a guarantee of 50,000 hours of illumination with no servicing required and uses just one third of the energy of traditional lighting.